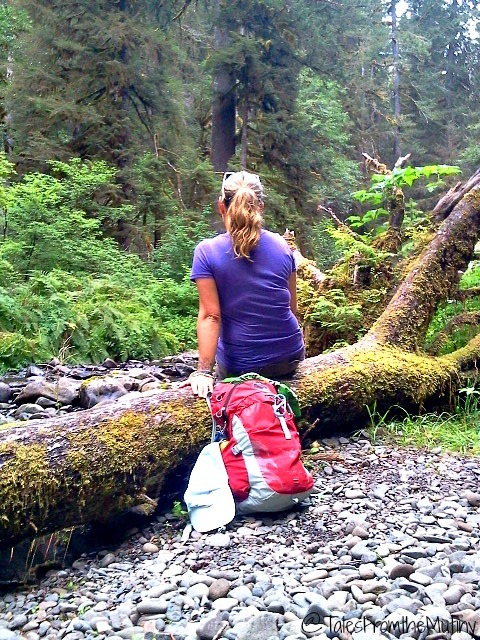 After our full day hike at Obstruction Point in Olympic National Park we decided to take it easy on our next adventure. Since I (Lynn) had visited Sol Duc Falls earlier in the week with my friend, Kim, leaving Clark at home alone, I decided he should see it too. 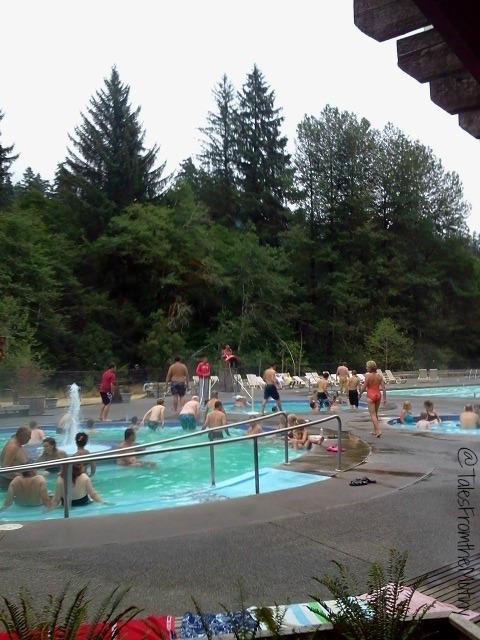 (Mainly because it has a hot springs). 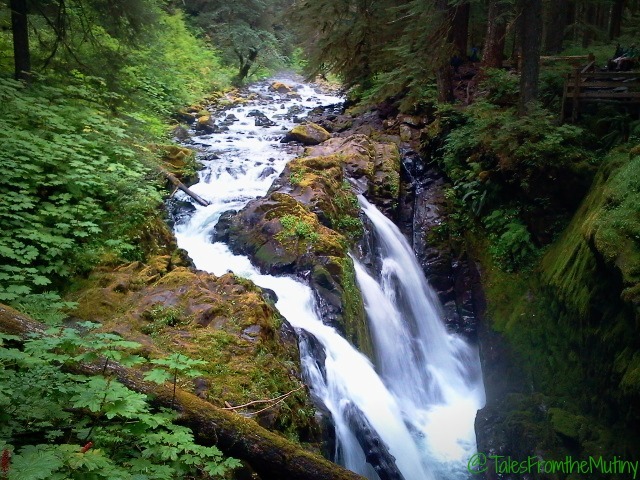 Sol Duc offers several different hikes through old growth forest as well as a few sub-alpine hikes. 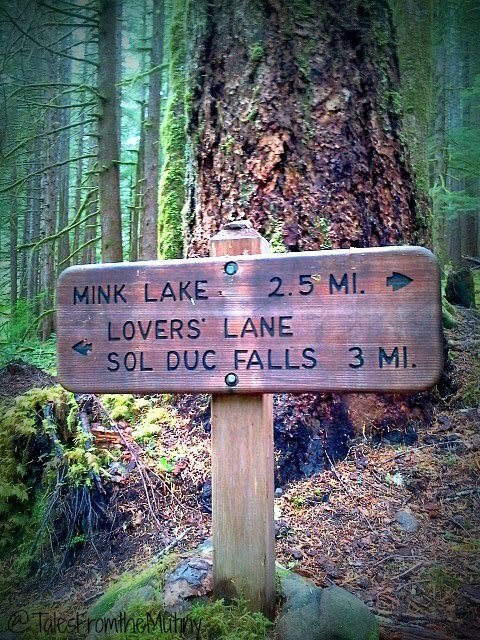 We opted to hike Lover’s Lane, an easy 6 miles loop (with only a 200 foot elevation change) that also provides access to the famous Sol Duc Falls (trail map). Part of the hike traverses through the primitive campground which looks nice, yet crowded, but with no hookups and the dense tree cover it’s also not solar friendly (I imagine generator use is okay but being so close to other campers and tenters it doesn’t appear to be a good choice for RVers). You also can start, and end, the hike right at the resort where the hot springs are located. The hike itself is gorgeous and suitable for most levels and ages. Granted it is long so be sure you’re up to it before you set out. 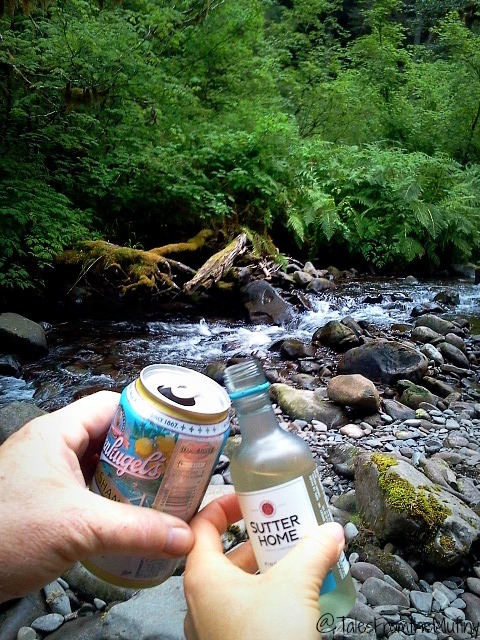 Much of it traverses along the stream and there are many places you can stop and rest, enjoy lunch or a snack (or a beer and wine), or even dip your feet in the water. It’s heavily shaded and can be quite damp. But it’s very pleasant and once we were out of earshot of the hot spring pools it was nice and quiet. 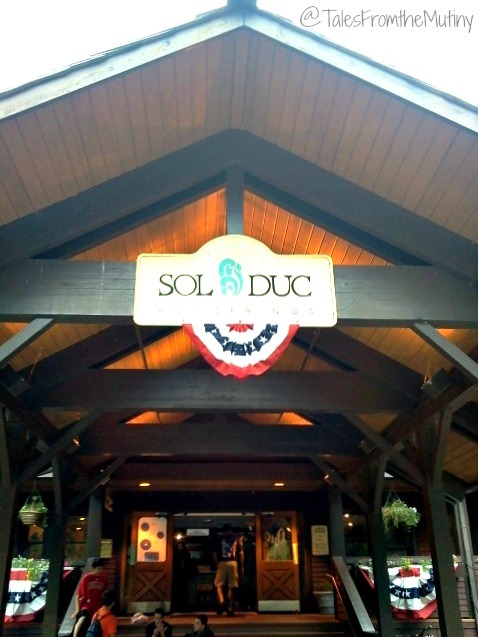 Sol Duc Resort is run by a concessionaire so the hot springs are not free. But after our tough hike the day prior the $13.50 fee (per person) was money well spent (there’s a twilight price of $9.25 applicable for the last two hours they’re open). There’s an RV campground about a quarter of a mile away with full hookups for around $43 per night for your convenience but with only 17 sites it’s advisable to make reservations (we opted to stay at Shadow Mountain RV Park for the week and drive the Jeep into the park). There’s also a poolside deli, restaurant, a few groceries,a gift shop and cabins for rent. There are 3 pools available for soaking (99, 101 and 104 degrees) as well as a cooling pool (temperature varies with the ambient air temperatures). There’s a bit of a rotten egg odor, which isn’t abnormal for springs heated by volcanic gases, but that’s more tolerable than the crowds. I guess late August is still prime time for visiting this area. We were pretty much shoulder to shoulder with other soakers so this isn’t your typical laid back experience…you’re not going to find yourself sipping cocktails or reading a book while you enjoy spa music, or nature sounds. No, this kinda reminds me of going to the public pool on a hot summer day when school’s out and parents want a break from their kids. There doesn’t seem to be any restrictions on where kids are and aren’t allowed so you might also have to deal with screaming and getting splashed and, if you’re lucky, you might get to participate in a rousing game of hide the water bottle from some kid’s little brother (to be honest, it was quite fun but if kids and sharing aren’t your thing you might want try coming early in the morning or late at night). 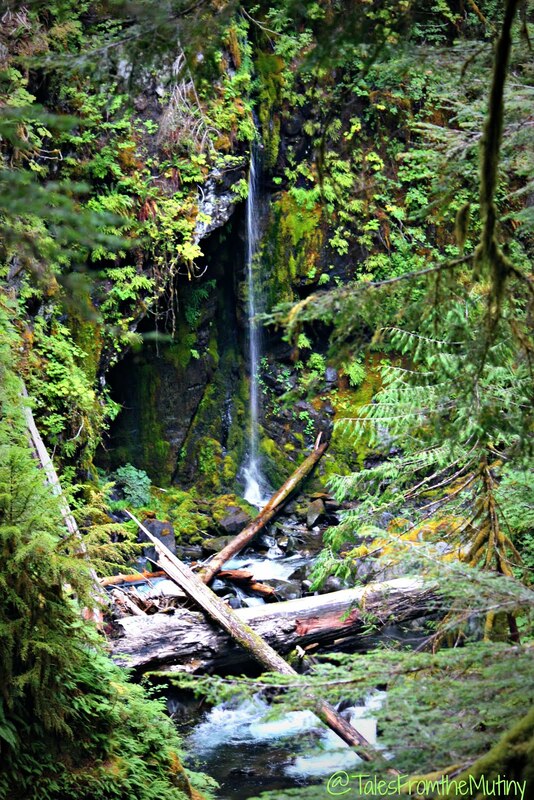 The Sol Duc area of Olympic National Park shouldn’t be missed. 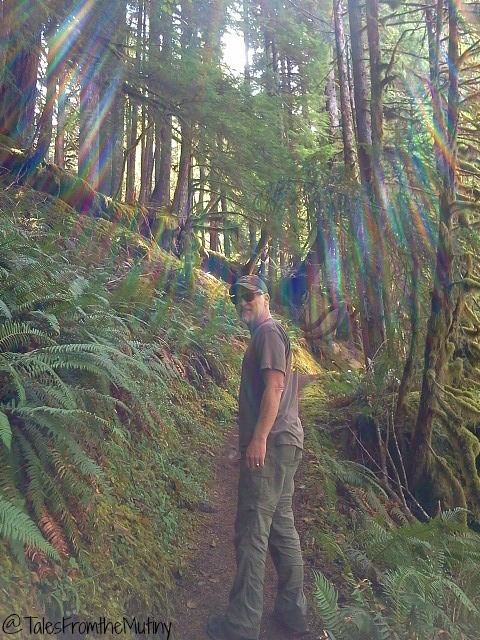 Actually, no part of Olympic NP should be missed since they each unique and awe inspiring. Looking back through photos to compose this series of posts reminds me of how varied the climate and vegetation is throughout the park. You can spend weeks or months or even years in this park and not see it all. 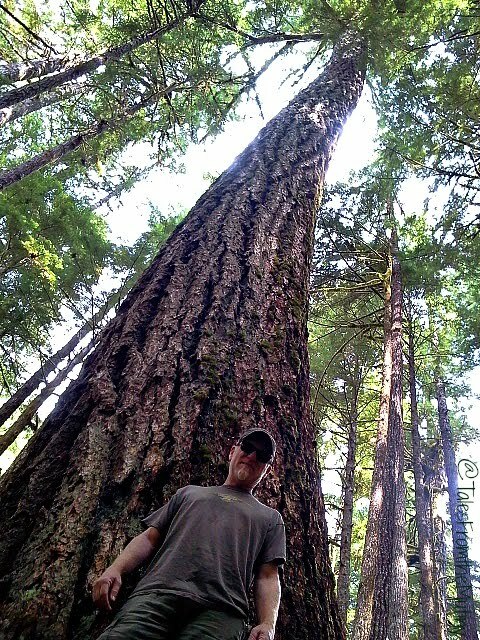 So, if you’re planning a trip to the Olympic Peninsula be sure to give yourself plenty of time.